Do you need an up-to-date list of certificate holders to use with Quickscore? 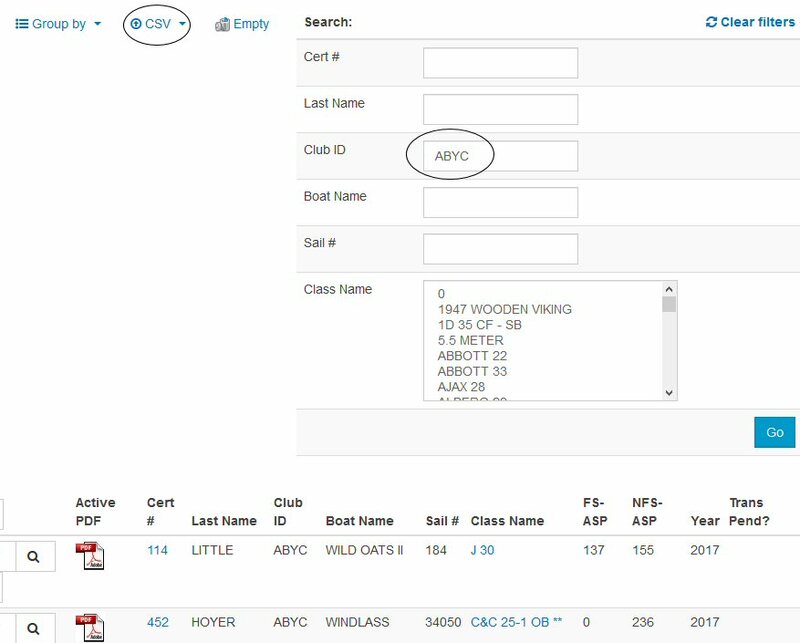 You can now use the Certificate Query function of our web site to create a csv file (Only available to "Registered Handicappers") that is importable into Quickscore. 1. Choose your Member ID from the Certificate Query function. 2. click on "CSV" located above the results of your query. 3. You will be prompted to "Export to CSV" (it is in a comma delimited format) and you will be able to open it in any MS Excel or similar program. 4. Once completed you will be prompted to "Download Here" to save the file. 5. You now need to change the header row on the file you saved so that Quickscore can import it. Open the file you created in step 3 and 4. You are best to use a spreadsheet like Excel. 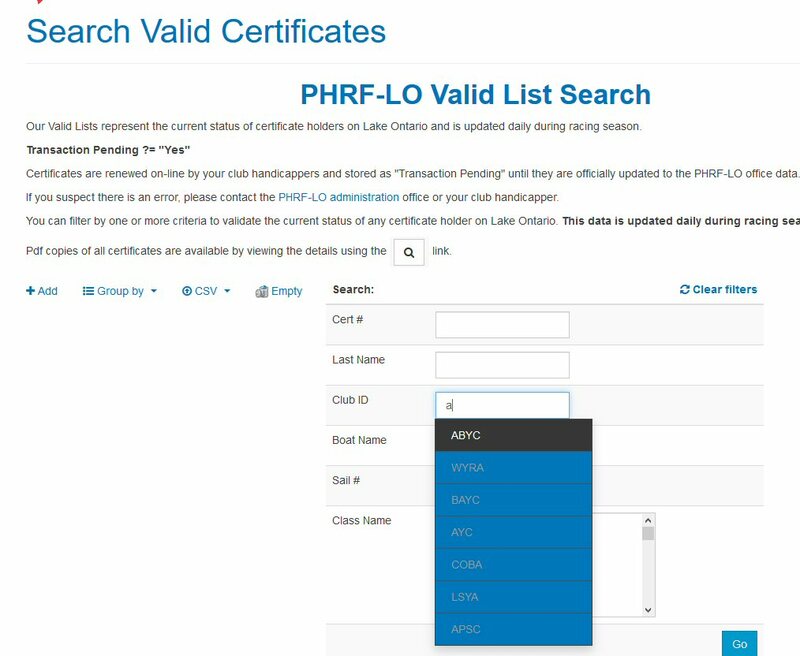 In the first row you will see column headers like "Cert #, Last Name, Boat Name etc etc". Those are the headers you need to change. 6. The list of headers that Quickscore requires are as follows: (available in Quickscore via "Help/Hints", "CSV Merge Headers"
7. 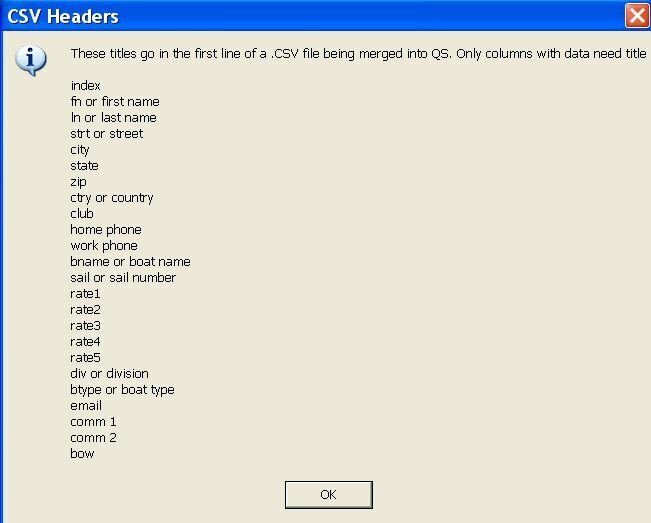 Change the first line of the csv file to match the headers as listed by Quickscore. If you do not have data for some of these, it is ok, Quickscore will ignore it. 8. Select "File", "New Reg File"
9. Select "File", "Merge exsisting Reg File" and you will be promted to "Select File to Merge". Change the "Files of type" to "Comma Delimited Reg Files" and browse to the location of the file you saved in step 3 & 4. 10. Quickscore will confirm "MERGE FILE LOADED" and you will now see your certificate holders in your Register.